Case study: Rebecca McCullough | What Car? 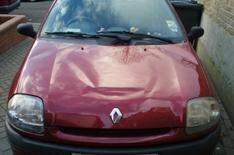 Rebecca McCullough contacted What Car? when the bonnet on her MkII Clio flew up while she was driving on the A4 earlier this month. She says: 'It didn't smash the windscreen, but the force smashed the interior light, damaged my roof and completely deformed the bonnet. 'Luckily I was not going at speed and got the car off the road, but if it had happened 20 minutes later I would have been on the M25, and who knows what could have happened. 'I think it's pretty poor that Renault is saying the issue is down to the owner not maintaining the catch; I get my car serviced regularly. How would I know I should be checking a bonnet catch regularly without them telling me? 'Renault UK sent Miss McCullough her reassurance letter on the 11 May 2007. 'The AA report is not a technical diagnosis and we do not accept that there is a design or construction defect with the bonnet catch mechanism of the MkII Clio.